Yesterday we marked four years living in Tallinn. This photo was taken as I walked back home in the morning, the sun shining, the snow so vibrant and fresh. So Estonian. It feels good having been here four years, so I felt I'd break from my current blogging style (for one week at least!) and throw out some thoughts and reflections on our time here. Let's see what comes up. Moving to Estonia (for us) wasn't a difficult move. Quite the opposite. Though we will always miss the dear friends we left behind in our previous home city of St Petersburg, moving the relatively short distance west has always been something special in what it offered in closeness to nature, as well as ease of getting around a much smaller and less populated city. We were therefore used to winters, and in fact, winters have seemed cleaner here (when it has snowed, anyway!) than maybe we ever got to experience in St Petes, living so close to the centre as we did then, there was no nature in easy reach of us so we never got to really see that side of winter life, besides the occasional church weekend away that we had during our time there. We'd also got used to living in a flat/apartment, compared to a house as we had been living in the UK. Due to cost of living in Russia, we'd spent all our time (aside from the first ten days spent in a hostel) in the same nicely finished, but very cosy, two roomed flat. Being able to get a four room flat for less money in Tallinn was always going to feel much more spacious. For all these things we are very grateful. We've grown too as a family over this time, plus I hope grown in understanding of the task ahead of us, as we roll into year five and all that this, and the many others ahead of us we trust, might have in store for us. I guess the biggest contrast in our two lives abroad (the nearly four years in Russia and these last four years in Estonia) must be what has happened church wise. I've probably touched on this in previous posts, so don't really want to repeat myself, but as I reflect back, if you'd asked the 'Newly arrived to Tallinn Tim' back then what he thought might have happened after four years regarding seeing a new church gathered, I would have probably envisioned more than might otherwise be on the ground. Of course, there is a lot of invisible stuff that no one really knows about, which I'll come back to in a minute. Back then, my only other experience of cross cultural church planting was from what we'd just gone through in St Petersburg. Moving in the August, the church plant's first public Sunday meeting just over 13 months later in that September, 2013. Two and a half years after that first Sunday, we were being sent out as a family to plant a new church into Tallinn. Bam bam bam! Now, I knew it wasn't going to be the same in Tallinn. I think if you read through the early posts around the time we moved here, you'd pick that up. Recently I've posted how Estonia is in practice the most atheistic nation on the planet. In a recent conversation with a local pastor here in Tallinn, a man with over fifteen years experience living and serving other churches right across the nation, he estimated there to be something like only 10,000 committed church goers in this great city. He also had a really interesting comment to make, which I think I'll save for my final thought in this post. Coming back to something I touched on earlier, and lets think about roots. 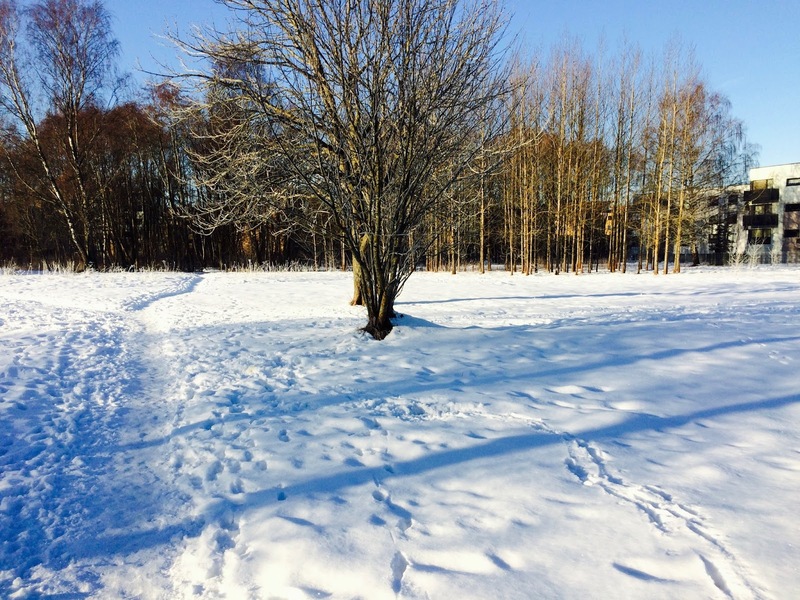 Outside in Estonia, there is snow everywhere. We have a number of plant pots on the balcony (our only chance of some sort of garden open to us at the moment). Inside these pots, as well as some shrubs that I trust will come to life again once the heat of spring really comes, there are a number of bulbs. I'd forgotten about them really, and looking out the other day at what was clumps of rather sad looking old growth from the plants from last year that now needed removing, it would be easy to think there was no life there. It is freezing, there is snow everywhere, and the sun doesn't appear for very long, even on sunny days. But removing most of this old growth, there they were. A few bulbs are starting to break through the soil, green life visible in an otherwise soil filled existence. Life finds a way. In a month or two, there will no doubt be dozens of flowers pressing through. Right now, the roots are going down, drawing what they need from the soil to push up through the surface. These last four years have certainly seen us put roots down here in Estonia. We aren't going anywhere fast, that's for sure. God has called us to this people and therefore we are here until (or if he ever does) God calls us anywhere else. Jesus often talked about seed falling to the ground, or a mustard seed which whilst small, grows to become the biggest of all garden plants. So you see, when roots are getting established, it might not look like a lot else is actually happening. But don't underestimate the power of good roots. Just look at the trees destroyed when even moderately gale force winds press in. Relationships with those in this city also have deep roots, which in their proper time will result in fruit of some kind. We know more people outside of the church here in Tallinn than we ever have at any other stage of our life. That's exciting, and whilst it doesn't mean people are ready to get saved soon (if ever) it does suggest God has been doing something behind the scenes (or below ground) that we might not yet fully realise. We've said already how that as a church plant we need more people to come and join us. We are prepared to wait for this to happen. How long will we wait - that's a good question, which I've no better answer than really say as long as it takes, or until God says otherwise. You see, as a family (and I'd certainly include our two girls in this conviction because of what they've said to us this year) we believe it was God who called us to Tallinn, and that His purpose for us here was to be involved in a church plant. And whilst things might not have gone as they had for us in Russia, these two things still remain true. So we need to navigate a new way through, and find out what God has for us in the mean time if, for example, ten people move to join us but only arrive in two years time. What happens before then? This is something that we are now working through - and have a solution for, actually, though can't say that here, just yet, as we need to continue to pray through it and talk it through with some folks here. But it certainly involves waiting and praying for the future workers (you?!) to come and join us. Tallinn is an amazing place to live, we've managed it for four years already, and believe me, when I look at me from this angle, there is nothing at all about me that makes me in anyway more able to do this than the next person. Honestly. So if I can, anyone can and that's the bitter truth. Appearing as a family on an American TV show that's been shown even here in Estonia, which people we know have then seen many times! Being interviewed by the main national newspaper and having a double page article on me. Me and Mia visiting the President's home and office. Getting spotted on TV (at a volleyball game) and having my recent tweet broadcast live during the Estonian song contest selection. Having my novels stocked by the national book store chain. And so much more, besides...! I'll finish with a very interesting thought I was told by a fellow pastor here this week. It fits with something I felt once being here, which was the fact that if we are going to live and serve in Tallinn for many years, it didn't necessarily mean we couldn't be leading the whole thing. My friend said, whilst often the model as a foreigner is to see a 'native' person leading the works as the ultimate goal, in relation to Estonia (maybe applicable wider as well, as situations warrant) this is a total misnomer. He pointed out that Estonians haven't been very good at reaching Estonians, hence the fact that the nation is the least spiritual nation on the planet (numerically). He has a good point. I guess I might at times thought that the ONLY option was to see Estonians reaching Estonians. But that would be like saying that slaves needed to end slavery, or that obese people were the only ones to deal with obesity issues, or the poor were the ones to end poverty. Of course not! The poor can't end the cycle unless the rich change things and then share what they have with those that don't. I see what he meant about Estonia. If Estonians were reaching fellow Estonians then we wouldn't need to be here in the first place - would God have even needed to have called us. Did he make a mistake, therefore? One situation (true and which happened to me, though I'll keep names out of it for obvious reasons!) was at a prayer meeting. I asked an Estonian to speak with another Estonian visitor (they were of the same gender) who was there for the first time, me obviously seeing the fact that they'd be best to communicate and welcome that person than I would (I'd seen this visitor briefly on the door as they'd arrived, and they didn't speak either of the two languages I was most proficient in.) When I arrived back in to the main room, I pointed out this visitor (clearly another Christian, as it was a churches together joint prayer meeting I'd been hosting for a short time) and this person said to me "Yeah, who are they?" to which I'd replied, with eagerness, "Go and ask them." The instant reply was "I can't do that, it's not Estonian" and they refused to speak with them. A fellow Christian not able to speak with another Christian because they didn't know one another. Needless to say, I went over and spoke a little to this person in my basic Estonian, but midway through the evening, this visitor just left, clearly assuming there was no one there who spoke her language fluently enough to feel a part of it all. But it makes the point from above. If this really is the view point (and believe me, this person who'd said this to me really isn't just your average Estonian believer, they've been around the world and seen lots of church in the West as well) what hope is there of reaching Estonia, if we leave the job only to Estonians? They have a part to play - absolutely! And there ARE great Estonian churches and leaders in this country. But non Estonians have a vital role to play, too. That's my point. Don't count yourself out from moving here because you aren't Estonian. You might just be the very thing this nation needs!